Great greeters – Stephanie Baer and Mary Jo Pasek – were busy selling raffle tickets to us as we all arrived on the 12th floor. I didn’t know until a bit later that these wonderful ladies were subbing for Brenda Nakanishi and Andrew Ozanich. Cheryl Biggar was also a sub today for Sister Judy with the invocation. Dr. Joe Nunez, as appointed, led our flag salute and Bill Black got us all in the mood for baseball season with the song, “Take me out to the Ball Game.’’ There were more members “Root, root, rooting” for the Dodgers than any other team. Prez Denise thanked greeters, scribe (Sandy Magley), Marlene Heise for subbing for Leslie, and Cheryl Scott for taking pictures (which return with this issue. Sandra Quigley said there were no visiting Rotarians, but actually, Steve Gibbs from East was there. Since he was part of today’s program, he slipped in under the radar. One of our Interactors brought her dad, Ricardo DeAlba. Three Interactors from Golden Valley were also present: Anthony Almarez, Samantha DeAlba, and Paola Rodriguez. Their advisor, Jennifer Yamauchi, was also present as a guest. Celebrations were a bit light this week: Jeff Haynes had a 24-year Rotary anniversary; Dr. Joe had a birthday; congrats to Mike O’D for completing last week’s word search – as did MANY other members, Kay and myself included. Denise then also had all members complete the volunteer hour sheet by checking the box(es) of the projects you had/will work(ed) on this year. All members are expected to help with Thousand Flags. Part one of the program was the Four Way Test essay winners. An impartial panel of BBRCers had previously read all submissions and ranked the top 3. 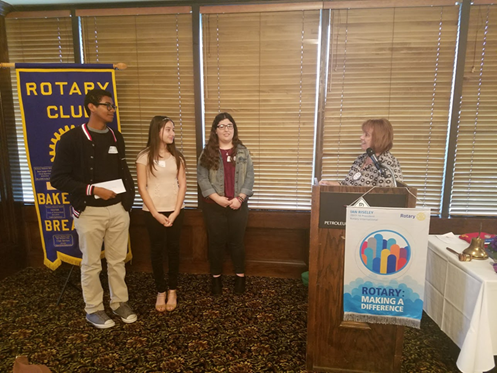 Each Golden Valley Interactor read his/her essay, then Bobbie Hake awarded 3rd place, $150, to Anthony, 2nd place, $250, to Samantha, and the winner, $400, was Paola. 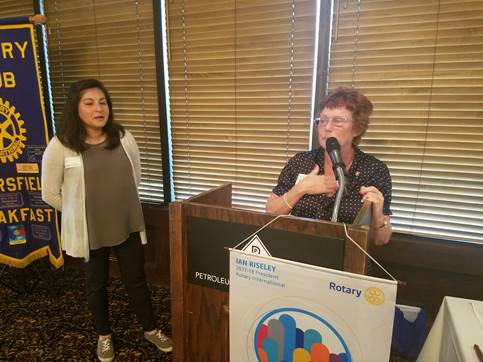 Part two of the program was the induction of Golden Valley’s Interact Advisor, Jennifer Yamauchi, as an Honorary Member of Bakersfield Breakfast Rotary. Both Denise and Jennifer fought back tears, the former because she was so proud to bestow this honor, and the latter because she was SOOO surprised! Jennifer received 2 Rotary pins, a Rotary flag, and one of our red Rotary tee shirts. She then thanked the club, her husband, and her mom! Part three of the program was a review of KernYES by Steve Gibbs. After a brief video presentation which showed some speakers and students involved in fun activities, Steve thanked our member Tom Burke who was a big liaison, as well as Denise for staying the course of the long day. BBRC was well represented with about 10 members. Steve also thanked Jennifer for her help with food. Next year’s event will be on Feb. 23 at the same location in Taft. Denise gave a brief account of her time with the purple team: 4 breakout sessions, 3 motivational speakers, FOOD galore, and a final dinner and dance at night. Jennifer told us that KernYES was like RYLA on steroids. The final part of today’s program was the State of the Club. Secretary will report on April 18. Treasurer Will Duerksen reported we are a bit behind, but invoices will be combined with statements very soon. Some alternative ways to pay dues and other expenses were suggested, and email reminders will be mailed if one’s account is 60 days late. 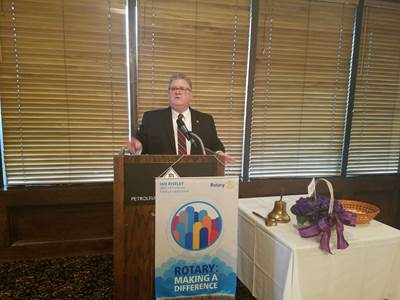 Foundation president Ron Nelms reported we have over $100K and will have one more Foundation meeting this year. Pat Thompson reported that we have inducted 4 new members so far this year but have lost 2. There will be an upcoming Fireside Chat at Pat’s house. He asked members to complete monthly surveys. Dave Spalinger reported we’re averaging 75% participation in all projects. Mike O’Doherty reported that International projects are going well. We helped with the orphanage in Tijuana with Tehachapi and Ridgecrest. We’re working on a rainwater harvesting project, but that takes a long time – so long that it will continue into Ron’s term and maybe even Cheryl’s. There are 2 grant proposals: one for Seal Center and one for mats in Afghanistan for the mom-teaching project. We’ve donated $1K to Puerto Rico for hurricane relief and $2K to CSUB for the Memorial Grove. Jackie Maxwell reported that we will continue to have Vocational Moments. Also, she asked us to consider nominating someone for Above and Beyond, with will be collected by April 18. Heather Ward reported on the upcoming Thousand Flags. Sponsorship forms were on the tables, and she asked members to consider asking friends/coworkers to help with sponsorships, too. Again, 100% Club participation is anticipated. Next week’s meeting is offsite at Foothill High School. PLEASE, PLEASE, PLEASE let Jeff Haynes know if you’re attending so there will be enough food (unlike our last offsite meeting). Marilee Reagor won the 50/50 drawing and Heather Ward got 100 Paul Harris points.